TORONTO — Two unruly Red Sox fans were ordered to leave Rogers Centre in the bottom of the eighth inning last night. Escorted by security guards, they marched up the aisle behind the first base dugout gleefully pointing to the team logos on the front of their shirts, as the few Blue Jays supporters still in their seats jeered. You can’t blame the two fans for being a little rambunctious. Their team is certainly playing the kind of baseball worth boasting about. Welcome back to the pennant race. The Sox hit four home runs, two by Bill Hall, to back the dominant pitching of Clay Buchholz, and thrashed Toronto, 10-1. With the Rays losing, the Sox are only 3 1/2 games behind in the American League wild-card race. They remain five games behind the Yankees, who came back to beat the Rangers. The Red Sox have won three straight, five of seven, and 11 of 16 to get back into contention after a slump that lasted most of July and coincided with a rash of injuries. At 66-49, the Sox are 17 games over .500 for the second time this season. They will try for a three-game sweep this afternoon with John Lackey facing Toronto rookie Brad Mills. 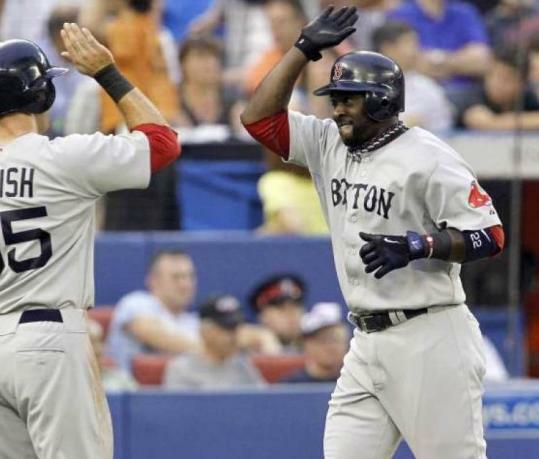 The 10 runs were the most scored by the Red Sox since a 14-3 victory at Rogers Centre July 9. An offense struggling to score has put up 17 runs in the last two days. The Sox had 14 hits off four Toronto pitchers last night, six for extra bases. J.D. Drew and Adrian Beltre also homered in support of Buchholz, who went eight innings without allowing an earned run. Buchholz (13-5) allowed five hits, all singles, with two walks and four strikeouts as his earned run average dropped to 2.49, the lowest in the American League. As the Red Sox make a move, it is with Buchholz helping to lead the way. The righthander, who turns 26 on Saturday, has given up only five earned runs on 21 hits over 30 1/3 innings in his last four starts. The Sox have won seven of the last eight games he has started. “You don’t ever know with young pitching. But when they find it and they understand it, it’s exciting,’’ manager Terry Francona said. Buchholz was hitting 96 miles per hour with his fastball in the eighth inning. Toronto righthander Shaun Marcum had held the Sox to one run over 14 innings in two prior starts this season. But he lacked command from the start, walking Drew and David Ortiz, hitting Beltre with a pitch, then walking Mike Lowell in the first inning to force in a run. Rookie Ryan Kalish missed a chance to inflict more damage by striking out. That Marcum needed 36 pitches to get through the first inning seemed like a good sign for the Sox, and it played out that way as Hall’s two home runs gave them a 4-1 lead. Hall now has 15 homers, the fourth most on the team despite having had only 235 at-bats. He has seven homers in his last 49 at-bats. Once a starter for the Brewers, Hall endured a three-year slide that included being sent to the minors, being traded to Seattle, and then being traded again to the Red Sox. A utility player at the start of the season, Hall is one of the few position players to stay healthy, and has given the Sox unexpected production. Hall is hitting a modest .247. But Francona values his versatility and attitude. Marcum (10-6) couldn’t get an out in the fifth inning. Drew led off with a home run to right field, his second in as many games. Victor Martinez and Ortiz followed with singles. Beltre then launched a home run to right field, giving him 21 on the season along with 79 RBIs. Lowell, who was 3 for 4, doubled off Brian Tallet and scored on a hard single to center by Hall. Hall has had four RBIs in a game twice this season, both coming against Toronto at Rogers Centre. The Sox are 9-2 against Toronto this season, outscoring the Jays by 30 runs.